Landing: March 7 @ approx. 12:36 p.m.
That's gonna wrap up the Flight Day 3 activities for the astronauts. They have run into overtime tonight getting the ELC 4 installation operations completed. Since they'll be getting to bed late, Mission Control is going to let them sleep an extra half-hour in the morning and wake up at 7:23 a.m. EST. The Express Logistics Carrier No. 4 has been installed on the International Space Station, becoming an external spot to stockpile spare parts. The pallet-like structure was launched with a replacement thermal radiator for the station's cooling system, folded up in accordion fashion, on its top surface. If one of the station's existing radiators needs swapped out in the future, this spare will be available for astronauts to use. The flip-side of ELC 4 features several attachment fixtures to accommodate on-orbit equipment stowage. Two items earmarked for placement on a pair of those slots are the flex hose rotatory coupler and a cargo container brought to the station aboard the Japanese HTV freighter last month. Initial capture of ELC 4 is complete. The arm's joints are being limped while second stage capture occurs. The ready-to-latch indicators have triggered as the astronauts begin to install ELC 4 on the truss. The arm is getting ELC 4 lined up with the attachment mechanism on the Starboard 3 truss. Maneuvering of the station arm with ELC 4 securely anchored on the end is underway. Discovery's arm has let go and moved away, its job of temporarily holding the payload while the station's got itself relocation now finished. The station's Canadarm 2 is in control for the rest of tonight's installation of ELC 4 to its permanent home on the truss backbone. The "handback" event has occurred as the station's robotic arm retrieves the Express Logistics Carrier No. 4 from the shuttle's arm. And now the station arm has ungrappled the Harmony module fixture to swing over and pick up ELC 4. The base change for the space station robot arm is complete. Meanwhile, the shuttle's arm has rolled the pallet 180 degrees to achieve the desired orientation for handing this payload back to the station arm. The station arm's free hand has grappled its new anchor point on the mobile transporter to become the arm's shoulder. The ground will remotely control the procedures to release the arm's old shoulder/new hand from the Harmony module. "It is and it's kind of a neat one because we'll be working with both the station arm and the shuttle arm ... I'll move over to the station side and for the first time we'll be working out of the Cupola as the robotics work station so that's going to be a really neat thing. "Up 'til now my experience has been working in the laboratory on the robotics work station where you're looking at video displays of where the arm is and what you're grappling to and this is going to provide this like 360, beautiful view of the real thing going on out there. "Eric and Al will be back on the shuttle working the shuttle robotic arm and with the station arm, (Mike) and I are going to pull the ELC out of the payload and then we'll position it so that the shuttle robotic arm can grab it and while they have it, holding it out there in space, we're going to move the station arm back over to another place on the space station and do what we call a Walk Off which is basically plug the other end in on station and then take the end that was plugged in off and use it as the end effector to grab the ELC again. "And then we'll hand it back from the shuttle arm, station arm will take it and then install it over onto the earth facing side of the space station truss." Mike Barratt and Nicole Stott have disengaged the space station's arm from ELC 4, allowing the crane to pull away. Over the next hour or so, the arm's unique inch-worm feature will be put into use. The arm's free hand will reach over and grasp the mobile transporter on the station's railcar. The arm's shoulder currently anchored to the Harmony module will let go and become the new free hand to retake ELC 4 for mounting the pallet onto its permanent home at the Starboard 3 truss later tonight. The shuttle arm has successfully grappled the opposite side of ELC 4 from the station arm. Both robotic arms are holding the pallet for the moment. The station's arm will soon release and back away to complete this portion of the high-flying handoff. Discovery astronauts Eric Boe and Al Drew are moving the shuttle arm toward ELC 4 now. The station arm has maneuvered the carrier into the desired position for the shuttle arm to reach out and grab the structure. After being plucked out of its moorings, the ELC 4 pallet is being swung out over the starboard side of Discovery for upcoming handoff to the shuttle's robot arm. The pallet is up and out of the bay now. ELC 4 leaves Discovery where it's been stowed since October 11 awaiting Discovery's launch to the space station. The station's robot arm is in motion to hoist the carrier from the shuttle. All four payload retention latch assemblies (PRLAs) are open. The latches holding the pallet in the shuttle's payload bay are opening to free the structure for traveling on the end of the space station's arm. Commander Steve Lindsey is doing the latch work from aboard the shuttle flight deck. The International Space Station's robot arm has grappled the spare parts cargo carrier for unberthing from Discovery's payload bay today. Shuttle astronauts Mike Barratt and Nicole Stott are operating the arm from inside the station's Cupola. The two spacewalking suits carried up aboard Discovery are being transferred over to the space station's airlock module in preparation for use on Monday's EVA. The six shuttle astronauts are being welcomed aboard the outpost by the six-person International Space Station resident crew right now. Expedition 26 includes commander Scott Kelly, fellow NASA astronaut Cady Coleman, Italian Paolo Nespoli and Russian cosmonauts Alexander Kaleri, Oleg Skripochka and Dmitry Kondratyev. HATCHES OPEN. The hatchway between Discovery and the space station was opened at 4:16 p.m. EST. "We'll have to be very busy immediately after docking. We'll be able to get a quick handshake without crewmates on station. We're really looking forward to seeing them. We'll get a quick safety briefing and make sure that everybody knows how to be safe on that magnificent stack up there and then we'll go right to work. The ELC4 does come out on that first docked day and it'll be a very interesting time because it requires coordination between two robotic arms which is always kind of exciting. "We'll be using the station arm to actually remove that Express Logistics Carrier from the shuttle payload bay and that's a pretty big piece of equipment, by the way, with the radiator on it. Without the radiator, weighs about ten thousand pounds and so it's actually fairly massive. "Once we pluck it out with the space station arm, we'll then hand that off to the space shuttle arm while the space station arm then can walk off from where it is attached originally, which is on Node 2. It will then attach itself to our mobile base servicer which is an arm carrier, if you will, that goes along the truss and once it's established on to that mobile base, it will then take again the ELC from the shuttle arm and then we'll be able to park it in its final parking place which is down on the starboard truss. "So it's a bit of choreography. It's a testament really to how capable we are, if we want to get something from point A to point B and point B is a long way away, but we have to do it precisely and accurately and fairly quickly because all of these things can't stay out in the space weather too long without being connected to power, this is how we are able to do it. So we're very excited to be able to do this." Discovery has maneuvered the station into the desired orientation with the shuttle flying on the aft end of the complex. This keeps the shuttle's heat shield out of the direction of travel to guard against space debris hits. The docking ring has been retracted and the hooks and latches have driven shut to firmly connect the shuttle to the space station for its week-long visit. A series of leak checks between the docking ports will take the better part of the next two hours. Mission Control says it will take a little while longer before the final retraction of the docking ring can be performed. CAPCOM Steve Robinson radioed astronaut Nicole Stott that the crew may need to wait about 30 minutes until the shuttle-station stack are in a better gravity-gradient orientation. Discovery's docking mechanism is pulling the two craft together. The relative motions of the shuttle and station will be allowed to damp out over the next few minutes by the spring-loaded docking system. Later, the hooks and latches will be closed to firmly join the two craft and Discovery's Orbiter Docking System docking ring will be retracted to form a tight seal. The opening of hatches between the station and shuttle is expected in about two hours. That will be followed by a welcoming ceremony and safety briefing. Docking occurred two minutes early at 2:14 p.m. EST as the spacecraft flew some 220 miles above western Australia. CONTACT AND CAPTURE! Sailing in orbit on her last voyage, Discovery has arrived at the International Space Station to prepare the outpost for life after the space shuttles are retired. Discovery is delivering the Permanent Multipurpose Module, the final room that will be added to the station's U.S. section in this decade-long construction, plus an external spare parts carrier the astronauts will robotically transfer from the shuttle to the station's truss backbone later tonight. The shuttle's thrusters are programmed to fire in a post-contact maneuver to force the two docking ports together. That procedure is being armed. Just 10 feet separate the shuttle from the station. Discovery is closing at 0.08 feet per second. Current distance now 12 feet. The shuttle's approach must remain within a cylinder that's three inches and a closure rate of 0.10 feet per second plus or minus .03. Now 20 feet from docking. The final approach covering the last 30 feet is beginning. The alignment looks good between docking ports on Discovery and the space station. Range now 44 feet, closing at 0.14 feet per second. About 59 feet separate the shuttle and station, closing at 0.14 feet per second. Now 91 feet from docking, with the shuttle closing at about 0.15 feet per second. Nearing the 100-foot mark as the two spacecraft complete a pass over the nighttime Indian Ocean. The shuttle is 140 feet in front of the station complex now, closing at 0.18 feet per second. The shuttle is being flown manually by commander Steve Lindsey. This is his third visit to the International Space Station, having served as the commander of the STS-104 assembly flight that delivered the Quest airlock module in 2001 and the STS-121 resupply mission in 2006. Range now 170 feet, closing at 0.20 feet per second. Now 230 feet, closing at 0.21 feet per second. Discovery is 321 feet away from the docking port and closing at about 0.28 feet per second. The shuttle has reached a point directly in front of the station along the imaginary line called the velocity vector, or +V bar. The two spacecraft are flying in orbital darkness. Docking is scheduled to occur right at the next sunrise about 34 minutes from now. The astronauts have been given a "go" for docking from Mission Control's shuttle and station flight control teams. "Well, as the pilot, basically the whole crew is going be working on rendezvous and docking but as the pilot I'm primarily assisting the commander and kind of getting the profile right and doing the orbital burns and right after we get on to orbit, we're doing orbital burns that are actually setting us up for the rendezvous. "It's basically a bunch of orbital burns, small burns that correct our orbit and as we get closer, we make smaller and smaller burns and eventually we take over visually and then from the visual perspective, as the space station's flying around, we kind of pull up in front of it as if we were going around in orbit and then we end up visually docking." The distance between the two spacecraft now measured at 470 feet. Discovery is marking the arc from the point beneath the station to a point in front of the complex to align with the docking port on the Harmony module. Docking is about 45 minutes away. The pitch maneuver has been completed. Discovery is back in the orientation where it started, with the payload bay looking up at the station. The orbital path has taken Discovery and the station out over the open Atlantic now. The main engine nozzles of Discovery are facing the station now as the shuttle points its tail upward. The distance between the two spacecraft now measured at 582 feet. They are about to pass over Guyana and the northeastern coastline of South America. The formal photo-taking period has started for the Expedition crew positioned at windows in the Zvezda service module, now that the shuttle has rotated its underside in view of the station complex. Discovery is nose-up facing the station. The spacecraft are formation-flying about 600 feet apart as they fly over Brazil. The rendezvous pitch maneuver -- the 360-degree flip -- is beginning. The shuttle is the under the control of commander Steve Lindsey, who is flying the ship from the aft flight deck. 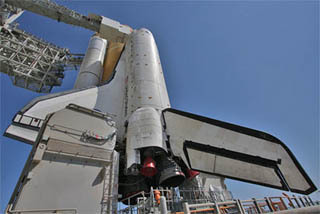 As the shuttle's underside rotates into view, the station's crew will photograph Discovery's belly with handheld digital cameras equipped with 400- and 800-millimeter lenses as part of post-launch inspections of the heat shield. The 800mm images should provide one-inch resolution for examination of landing gear door and external tank umbilical door seals. The 400mm will yield three-inch resolution. After completing the RPM maneuver, Discovery will fly directly ahead of the space station with the shuttle's nose facing deep space and its cargo bay pointed at the lab complex. Then commander Lindsey will guide the spacecraft to a docking with a pressurized mating adapter attached to the Harmony connecting module. Discovery is 650 feet directly beneath the space station as the duo approach the western coast of South America and Peru. Station astronauts are getting ready for their job to photograph Discovery's heat shield during the backflip about five minutes from now. Italian Paolo Nespoli will use the 800mm lens and NASA astronaut Cady Coleman will shoot 400mm pictures. Setup steps for the backflip are complete. The maneuver occurs once the preset window opens with the best lighting conditions. "We have the whole process of burning our engines to get in the right orbit and plane with the station we can dock and one of the moves that has become very popular with people watching I know is this rendezvous pitch maneuver that we'll do before we dock with the station where the shuttle basically does a full 360 so that the crew on station can take some detailed photos of the belly and different areas of the shuttle to make sure we don't have any damage and then we move in for the actual docking and I'm really looking forward to that. "This'll be the first time that I've had the chance to like have hands on with the docking system that actually captures the station with the shuttle so I'm sure that's going to be pretty impressive and then we get docked and pretty quickly, once we do all our pressure checks and open the hatches, we're over there." The shuttle's closure rate has slowed in preparation for commander Steve Lindsey to park Discovery directly below the space station for the upcoming backflip. "For rendezvous, I do the manual phase where I take over the vehicle at about 2,000 feet away from space station, fly up to position underneath the space station, do something called an RPM, Rotational Pitch Maneuver, or R-bar Pitch Maneuver which is basically is just a 360 backflip so that the space station crew can take pictures of our tiles and make sure they're okay from a thermal protection systems standpoint. Then I'll fly around the front of the vehicle and manually fly in to do the docking." Mission Control has given the shuttle crew a "go" for the backflip maneuver. The 360-degree flip should start in about 19 minutes. One final mid-course correction burn just occurred as Discovery flies toward the station. the European ATV-2 freighter docked to the station's rear port has positioned its solar arrays in the proper orientation for the shuttle's arrival. Distance separating the two spacecraft has closed to 2,200 feet. The shuttle is 3,000 feet from the station, closing at 5.5 feet per second. Just about 90 minutes from docking. All continues to go well in today's rendezvous. The third course correction has been completed to tweak the flight path toward the International Space Station. This was a 1-second reaction control jet firing that changed the shuttle speed by 0.24 feet per second. Discovery is inside 8,000 feet now, closing at 11 feet per second. The shuttle is 12,000 feet from the station, closing at 14 feet per second. Discovery has performed another of the available mid-course burns. Now 20,000 feet left to go. Voice communications have been established on the "big loop" between the shuttle and station crews so the astronauts can talk to each other on one channel. The shuttle is 35,500 feet from the station, closing at 20 feet per second. The speed will ease over the next hour until Discovery completely stops beneath the station for the backflip maneuver. The shuttle just completed the first of four available mid-course correction burns during this approach to the station. "Well, docking day, as we call it D-Day is a very big day for all of us. It involves the entire crew. All six of us will be involved in that. Steve Lindsey and Eric Boe as the commander and pilot will obviously be doing all the dynamic flight operations. My job will be to follow the entire docking timeline along with those two gentlemen and make sure that all of our navigational sensors, the things that allow us to come together to make our correction burns and eventually to dock with the station, are all working in an integrated fashion. "We have rendezvous radar. We have a laser range finder, which helps up out. We've got the overall navigation information that goes to the shuttle. All of those come together on a laptop-based program we call RPOP and I'll be, as we call it, the RPOP driver, making sure that all of those sensors are giving us a coherent picture which feeds all of our flight activities and I'm really looking forward to seeing all of that work together. "We've been training very hard to make sure that if one of those navigational sensors drops out, we can use the other ones to make our rendezvous work but overall it's again like conducting a little symphony of information and making sure that we get a good sound of it and end up with a good docking at the end." With about 9 miles separating Discovery from the International Space Station, the shuttle has performed the Terminal Initiation burn using the left-hand Orbital Maneuvering System engine. The 11-second firing changed the shuttle's velocity by 8.4 feet per second. The TI burn puts the shuttle on a trajectory to directly intercept the orbiting station over the next orbit and a half. The burn is the latest in a series of maneuvers performed by Discovery during its two days of chasing the station since launch Thursday afternoon. Docking is anticipated at 2:16 p.m. EST. Station video cameras have spotted Discovery as a bright dot on the approach. Discovery is 60,000 feet from the space station. CAPCOM Steve Robinson in Mission Control has radioed approval to the shuttle's crew for the Terminal Initiation burn that's scheduled to occur at 11:33 a.m. EST. Both the shuttle and the station flight control teams report all is in readiness this morning. As Discovery continues to close in, the station is 22 miles away now. The crew just performed a pulsing of the reaction control jets to refine the shuttle's trajectory. Discovery remains on track for docking at 2:16 p.m. EST today. "The third day in space starts out with us chasing down the space station...We'll get ourselves to a point about six hundred feet below the space station. We'll do a quick flip beneath there so they can take some of their high powered optics and take pictures of the rest of the shuttle that we couldn't inspect with the robot arm and then we'll continue to fly out about four hundred feet in front of the space station. From there we'll align our docking port with the space station's docking port and it's front and back on up to it in a slow waltz with the space station to do that. "Once we've got a good docking and a good airtight seal between us and the space station, even before we open up the hatches and meet the crew, we've got the Express Logistics Carrier which needs to be ready to come out of the payload bay right away and so that's going to be a choreographed sequence of events between our robot arm and the space station's robot arm." A circularization burn, known as NC4, has boosted the low point of Discovery's orbit on today's trek to the International Space Station. This burn lasted about a minute using both maneuvering engines to change the shuttle's speed by about 60 mph. Commander Steve Lindsey reports a 'tally ho' on the space station from out Discovery's front windows. The distance between the two spacecraft is down to 40 miles. Discovery is 63 miles from the space station now. The NH burn, a major orbit raising maneuver by Discovery's twin maneuvering engines, has been completed successfully. This has raised the orbit's high point near the space station's altitude. The shuttle Discovery closed in on the international space station early Saturday. Read our docking preview. The crew has marched through its early checklist of activities for today. Activities include aligning the orbiter's Inertial Measurement Units in the guidance system, powering up a subset of equipment known as Group B and performing a water dump from the orbiter. The Planning Shift of flight controllers in Houston have handed off to the Orbit 1 Team headed by lead STS-133 shuttle flight director Bryan Lunney and CAPCOM Steve Robinson. This team will be on duty for the first half of the crew's workday and the docking. The wakeup call has been sounded to Discovery's crew for Flight Day 3. This is docking day for the space shuttle, which will arrive at the International Space Station after a two-day chase since launch. Rendezvous operations will begin in about two hours. The Terminal Initiation burn is scheduled for 11:33 a.m. and the 360-degree backflip maneuver in expected to start at 1:15 p.m. Discovery should link up with the space station around 2:16 p.m. EST. Read our earlier status center coverage.